The 4th, revised edition of the Swahili Basic Course is founded on more than 40 years of experience which the authors have accumulated in teaching Swahili at universities and other teaching institutions. The course presents useful teaching material for universities and institutions which prepare for professional activities in eastern Africa. Furthermore, it is a suitable guide for self-instruction, since specialized knowledge is not required. 30 lessons supply the learner with a sound grammatical and lexical knowledge of the most important lingua franca of East Africa. The course is divided into the sections conversation, grammar, exercise, reading and vocabulary, thus combining theoretical foundation and practical language use. The included exercise book, now in its third and revised edition, completes the Swahili Basic Course. It contains the key to the exercise part as well as sentence practice, thus serving for the training and expansion of the learner’s speaking ability. Undispensable for self-instruction, the exercise book is a useful teaching support. 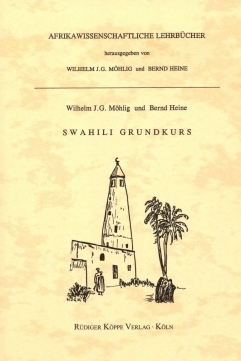 Furthermore, the included Audio-CD contains the exercises for listening and speaking that are dealt with in the Swahili-Übungsbuch. The texts are read by three native speakers from East Africa and run approx. for 4 hours, including the necessary breaks for reading the drills aloud by yourself.